Clouds had obscured Mt Adams all day except in late afternoon when a small window formed between the high and low clouds. I hoped the clouds might disappear as the day shifted to night and so I set my alarm for 10:30 PM. I had hiked into Muddy Meadows in Mt Adams Wilderness with the hope that I could photograph the Milky Way over Mt Adams. 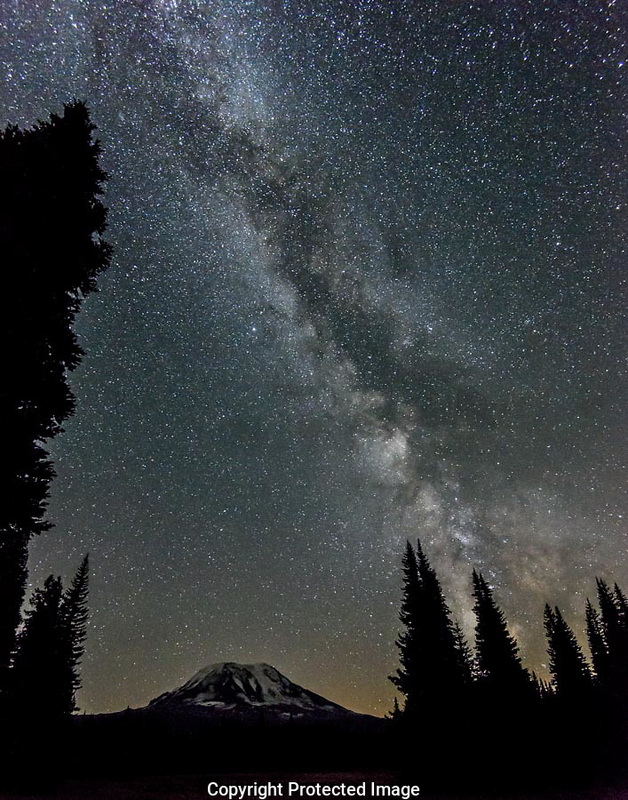 I have a personal goal of photographing the Milky Way over all 5 shield volcanoes in Washington. With a new moon just started, this night promised to be dark and perfect for seeing the Milky Way if the clouds disappeared. 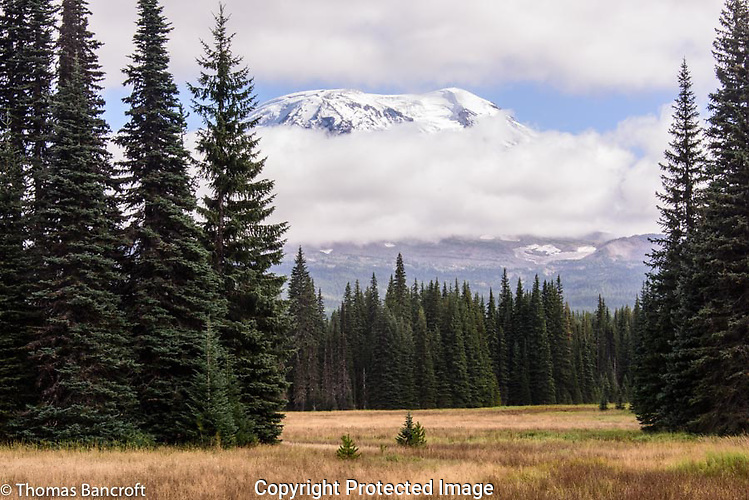 Lodgepole pines and firs surrounded the large wet meadow and the meadow had taken on a wonderful warm brown tinge as fall approached. At 10:30 PM the Milky Way twinkled above the mountain and I didn’t see a single cloud. I found a good place to watch the sky and the mountain. A few meteors streaked through the sky and one large one looked like a shooting rocket. Unfortunately, it was just outside of my camera’s view. I found the stars memorizing and lost track of how cold it was. My fingers slowly became numb in the low 40s temperatures. Little light pollution was evident and I could see far more stars than I can see in Seattle. Muddy Meadows sits on the north side of Mt Adams and a little northwest of the peak. The Milky Way stretched southwest. I wondered how many stars were out there? Some scientists estimate that we may have 400 billion stars in just the Milky Way and many have planets circling them. It always thrills me to think about the vastness of the universe and how small our planet is within the expanse of space. I stood staring at the stars when suddenly I caught the shadow of a dark object shooting by the right side of my head, maybe only an arm lengths away and slightly higher than me. Just beyond me, it dropped down to eye level and disappeared into the darkness without a sound. I thought an owl, maybe a northern pygmy-owl. It surprised me that I hadn’t jumped or even flinched. The owl must have been checking out what this strange object was in the middle of “its” meadow. Seeing it added an additional excitement to the night experience. I wondered what else might be watching me from the surrounding wilderness? I did it again here. I seem to drift into a meditative state each time I stand watching stars gradually drift west. My mind wanders from family and friends to thinking about wild country. Seeing wild country or experiencing it through literature, films and art always seems to leave me energized, happy, and excited for tomorrow. When I began to shiver, I realized it might be time to find my tent and my warm sleeping bag. I grabbed my camera and tripod, turned to head toward my tent, but stopped for one last look up and to wonder a little more. 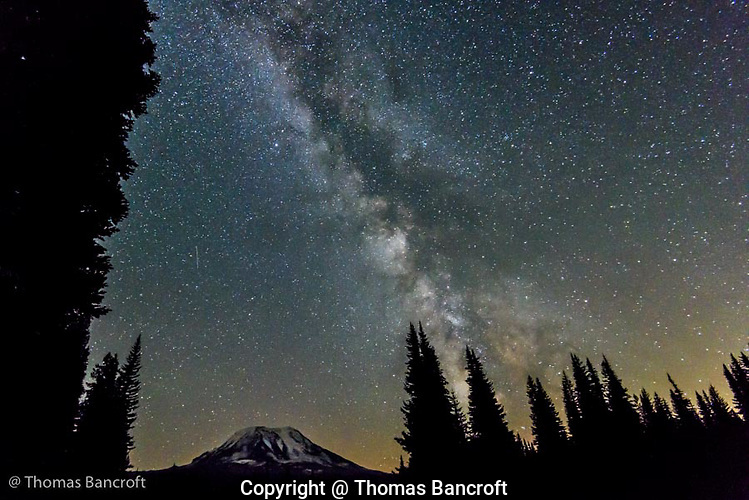 Do you enjoy seeing the Milky Way? Does it raise thoughts and feelings in you?